Rockstar Games says it still loves the PC, but don't hold your breath waiting for a mouse-and-keyboard version of Red Dead Redemption. To be fair, Rockstar hasn't exactly hit the PC with the Klingon ritual of Discommendation. Grand Theft Auto, Max Payne 3 and, soon, L.A. Noire are all available for the platform, after all, as are older franchises like Bully and Manhunt. But one notable absence from that list is last year's Western epic Red Dead Redemption. Rockstar addressed that hole in the lineup in a recent "Asked & Answered" session with a gently-phrased message that maybe it's time to just let it go. 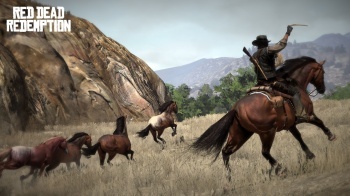 "We do know that, yes, there is just one title absent from our PC release plans - that game of course being Red Dead Redemption, and of course we're well aware that some fans have been asking for it," the studio wrote. "All we can say is that whenever it is viable (technically, developmentally and business-wise) for us to release a game for PC (or any other particular platform) - we will and we usually do; unfortunately, that is just not the case 100 percent of the time for all platforms." The response goes on to suggest that PC gamers be happy with what they're getting. Okay, so maybe the issue isn't exactly "addressed" in the firmest sense of the word. Platform viability is fine and dandy, but what does that actually mean? What makes L.A. Noire viable while Red Dead Redemption isn't? I don't get it, which is I guess the bottom line when it comes to RDR, too. On the upside, Rockstar said that the "Chicago Piano" Machine Gun, "Chicago Lightning," "The Broderick" and "The Sharpshooter" detective suits, the "Badge Pursuit Challenge" and other DLC will all be included with the PC release of L.A. Noire, which comes out on November 8.